We are independent distributors of AIM Australia. The AIM International product line offers the highest quality food and juicing concentrates, herbal supplements and health products available on the market. The products listed on this page are available for sale to our Australian customers. All prices are shown in AUD$ and are inclusive of GST and exclusive of shipping charges. Shipping is AUD $10.50 per order. Important note: When you place an order AUD$85 or more, you will be automatically registered as a member of AIM Australia and we will be your sponsor. Subsequent orders can then be purchased at these member prices and placed directly with AIM Australia. All orders shipped to an Australian address are invoiced at the AUD$ prices shown below. Should you have any questions, please don't hesitate to send us an email. A green barley juice which captures consistently higher levels of nutrition. A green barley caplet which captures consistently higher levels of nutrition. A unique wild garlic made from the leaf, helps maintain healthy blood pressure levels. Contains 1002 mg of alpine wild garlic per 3 capsule serving. Please click on the product picture to learn more about Bear Paw Garlic and what makes this product truly unique! When added to your bath, you'll find yourself both relaxed and rejuvenated. A combination of relaxing herbs, helps maintains a healthy attitude. AIM Flora Food is a unique probiotic. Contains Lactobacillus acidophilus, Bifidobacterium bifidum, and Bifidobacterium longum, to aid your digestion. These barley, beet and carrot juicing concentrates are perfect for any juicing program. 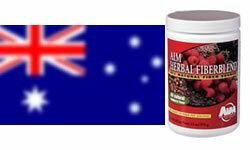 Sorry: AIM Herbal Fiberblend in Capsule Form is not available for sale in Australia. Combination of herbs, helps maintain a healthy lymphatic system which is integral to maintaining our immune system. Carrot crystalized powder provides a convenient way to achieve an improved diet with natural beta carotene. Combines spinach, field pea, faba bean, broccoli sprouts and barley leaves creates a one-of-a-kind whole food healthy product. AIM's Pycnogenol product combines 100 mg of green tea extract, 100 mg of rosemary extract, 50 mg of grape seed extract, 30 mg of N-acetylcysteine, 26 mg of alpha-lipoic acid, 2 mg of lycopene, and 200 mcg of selenium per serving of 2 softgel capsules. Provides 12 grams of protein in a low-sugar, low-carb, low-fat concentrate. Provides one of the most convenient ways to achieve an improved diet with iron supplementation. Concentrated beet juice that generates a nitric oxide boost, providing improved physical endurance.